Internal validation—A common approach is to split the dataset randomly into two parts (often 2:1), develop the model using the first portion (often called the “training” set), and assess its predictive accuracy on the second portion. This approach will tend to give optimistic results because the two datasets are very similar. Non-random splitting (for example, by centre) may be preferable as it reduces the similarity of the two sets of patients.1 4 If the available data are limited, the model can be developed on the whole dataset and techniques of data re-use, such as cross validation and bootstrapping, applied to assess performance.1 Internal validation is helpful, but it cannot provide information about the model’s performance elsewhere. Temporal validation—An alternative is to evaluate the performance of a model on subsequent patients from the same centre(s).6 10 Temporal validation is no different in principle from splitting a single dataset by time. There will clearly be many similarities between the two sets of patients and between the clinical and laboratory techniques used in evaluating them. However, temporal validation is a prospective evaluation of a model, independent of the original data and development process. Temporal validation can be considered external in time and thus intermediate between internal validation and external validation. We illustrate the above ideas with four case studies with various performance characteristics. The European system for cardiac operative risk evaluation (EuroSCORE) was developed using data from eight European countries to predict operative mortality of patients having cardiac surgery.16 The score combines nine patient factors and eight cardiac factors; it has been successfully validated in other European cohorts. Yap and colleagues examined the performance of EuroSCORE in an Australian cohort that was different from the derivation cohort, with a generally higher risk of death.17 For example, 41% of the Australian cohort were aged over 70 compared to 27% in the European cohort, and there were 15% v 10% with recent myocardial infarction. Yet the observed mortality in the Australian cohort was consistently much lower than that predicted by the EuroSCORE model (table 1⇓). Observed mortality for three risk groups was only half the predicted mortality. The calibration of the model in these new patients was thus poor, although it retained discrimination in the new population. A prospective study recruited 1421 consecutive patients having colorectal surgery for cancer or diverticular disease from 81 centres in France in 2002.20 A multiple logistic regression analysis on a large number of factors identified four that were significantly predictive of postoperative mortality. All were binary, although two (age and weight) were originally continuous. The investigators found that the number of the four factors present was a strong predictor of mortality (table 2⇓). The model development can be criticised: four variables were selected from numerous candidates, the number of deaths was small, continuous variables were dichotomised, and the authors replaced the regression model by a simple count of factors present, neglecting the relative weights (regression coefficients) of the four predictors. Nevertheless, when this risk score was tested in a new series of 1049 patients recruited from 41 centres in 2004,21 the mortality across the score categories (a kind of calibration) was similar to that in the original study (table 2⇑). Both datasets show a strong risk gradient with good discrimination, but for one category the observed and predicted event probabilities are quite different. This example shows the difficulty of judging how well a model validates. Non-invasive positive pressure ventilation may reduce mortality in patients with exacerbation of chronic obstructive pulmonary disease, but it fails in some patients. A prognostic model was developed to try to identify patients at high risk of failure of ventilation, both at admission and after two hours. Using data from 1033 patients admitted to 14 different units, researchers used stepwise logistic regression to develop a model comprising four continuous variables (APACHE II score, Glasgow coma scale, pH, and respiratory rate) each grouped into two or three categories.22 The model for failure after two hours of ventilation had a c index of 0.88. Predicted probabilities of events varied widely from 3% to 99% for different combinations of variables. The same researchers validated their model using data from an independent sample of 145 patients admitted to three units—it is unclear whether these were among the original 14 units. The Hosmer-Lemeshow test showed no significant difference (P>0.9) between observed and expected numbers of failures, and the c index of 0.83 was similar to that observed in the original sample. The high discrimination suggests that the model could help decide clinical management of patients. However, the size of their validation sample may be inadequate to support strong inferences. To reduce clinical uncertainty concerning preschool children presenting to primary care with acute cough, Hay and colleagues derived a clinical prediction rule for complications.23 They used logistic regression to examine several potential predictors and produced a simple classification using two binary variables (fever and chest signs) to create four risk groups. Risk of complications varied from 6% with neither symptom to 40% with both (table 3⇓). The c index was 0.68. Unfortunately, evaluation of the model in a second dataset failed to confirm the value of this classification (table 3⇑).24 The authors suggested several explanations, including the possibility that doctors might preferentially have treated symptomatic patients with antibiotics. It may simply be that the primary data included too few children who developed complications to allow reliable modelling. It seems to be widely believed that the statistical significance of predictors in a multivariable model shows the usefulness of a prediction model. Also, when evaluating a model with new data authors seem to want to calculate P values and conclude that the validation is satisfactory if there is no significant difference between, say, observed and predicted event rates, for example based on the Hosmer-Lemeshow test. Neither view is correct—P values do not provide a satisfactory answer. Rather, in a validation study we evaluate whether the performance of the model on the new data (its calibration and, especially, discrimination) matches, or comes close to, the performance in the data on which it was developed. But even if the performance is less good, the model may still be clinically useful.4 The assessment of usefulness of a model thus requires clinical judgment and depends on context. Simplicity of models and reliability of measurements are important criteria in developing clinically useful prognostic models.2 28 Experience shows that more complex models tend to give overoptimistic predictions, especially when extensive variable selection has been performed,29 but there are notable exceptions. As the aim of most prognostic studies is to create clinically valuable risk scores or indexes, the definition of risk groups should ideally be driven mainly by clinical rather than statistical criteria. If a clinician would leave untreated a patient with at least a 90% chance of surviving five years, would apply aggressive therapy if the prognosis was 30% survival or less, and would use standard therapy in intermediate cases, then three prognostic groups seem sensible. Validation of the model would investigate whether the observed proportions of events were similar in groups of patients from other settings and whether separation in outcome across those groups was maintained. Few prognostic models are routinely used in clinical practice, probably because most have not been externally validated.25 28 To be considered useful, a risk score should be clinically credible, accurate (well calibrated with good discriminative ability), have generality (be externally validated), and, ideally, be shown to be clinically effective—that is, provide useful additional information to clinicians that improves therapeutic decision making and thus patient outcome.25 28 It is crucial to quantify the performance of a prognostic model on a new series of patients, ideally in a different location, before applying the model in daily practice to guide patient care. Although still rare, temporal and external validation studies do seem to be becoming more common. DGA is supported by Cancer Research UK. KGMM and YV are supported by the Netherlands Organization for Scientific Research (ZON-MW 917.46.360). PR is supported by the UK Medical Research Council. We thank Yves Panis and Alastair Hay for clarifying some details of the case studies. Contributors: The articles in the series were conceived and planned by DGA, KGMM, PR and YV. DGA wrote the first draft of this paper. All the authors contributed to subsequent revisions. DGA is the guarantor. Royston P, Moons KGM, Altman DG, Vergouwe Y. Prognosis and prognostic research: developing a prognostic model. BMJ 2009;338:b604. Moons KGM, Royston P, Vergouwe Y, Grobbee DE, Altman DG. Prognosis and prognostic research: what, why and how? BMJ 2009;338:b375. Bleeker SE, Moll HA, Steyerberg EW, Donders AR, Derksen-Lubsen G, Grobbee DE, et al. External validation is necessary in prediction research: a clinical example. J Clin Epidemiol2003;56:826-32. Altman DG, Royston P. Evaluating the performance of prognostic models. In: Rothwell P, ed. Treating individuals: from randomised trials and systematic reviews to personalised medicine in routine practice. Edinburgh: Lancet, 2007:213-29. Mackillop WJ, Quirt CF. Measuring the accuracy of prognostic judgments in oncology. J Clin Epidemiol1997;50:21-9. Miller ME, Hui SL, Tierney WM. Validation techniques for logistic regression models. Stat Med1991;10:1213-26. Vergouwe Y, Steyerberg EW, Eijkemans MJC, Habbema JDF. Substantial effective sample sizes were required for external validation studies of predictive logistic regression models. J Clin Epidemiol2005;58:475-83. Ivanov J, Borger MA, David TE, Cohen G, Walton N, Naylor CD. 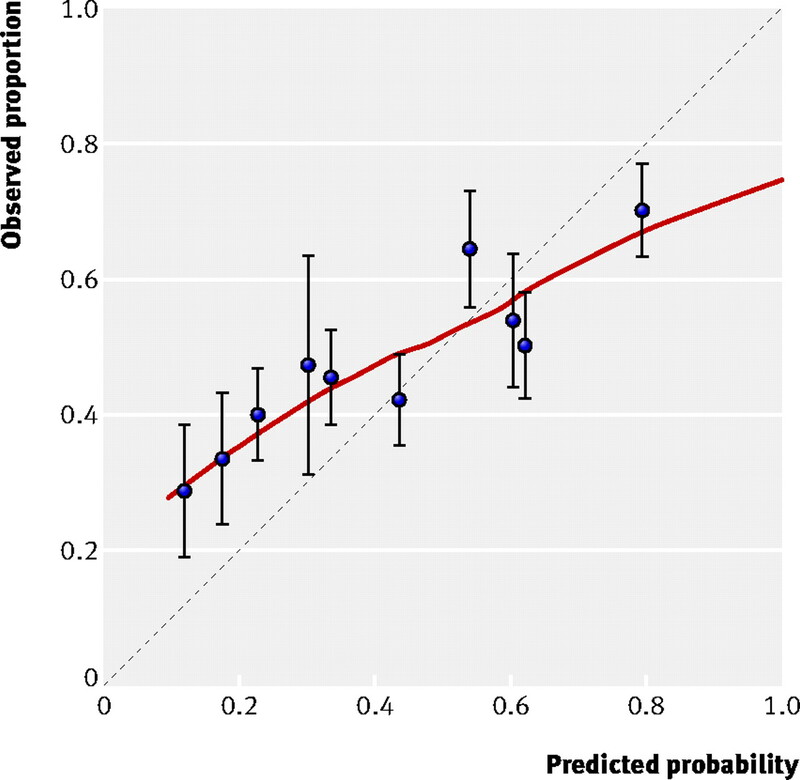 Predictive accuracy study: comparing a statistical model to clinicians’ estimates of outcomes after coronary bypass surgery. Ann Thorac Surg2000;70:162-8. Loeb M, Walter SD, McGeer A, Simor AE, McArthur MA, Norman G. A comparison of model-building strategies for lower respiratory tract infection in long-term care. J Clin Epidemiol1999;52:1239-48. Nashef SA, Roques F, Michel P, Gauducheau E, Lemeshow S, Salamon R. European system for cardiac operative risk evaluation (EuroSCORE). Eur J Cardiothorac Surg1999;16:9-13. Yap CH, Reid C, Yii M, Rowland MA, Mohajeri M, Skillington PD, et al. Validation of the EuroSCORE model in Australia. Eur J Cardiothorac Surg2006;29:441-6. Van Houwelingen HC, Thorogood J. Construction, validation and updating of a prognostic model for kidney graft survival. Stat Med1995;14:1999-2008. Steyerberg EW, Borsboom GJJM, Van Houwelingen HC, Eijkemans MJC, Habbema JDF. Validation and updating of predictive logistic regression models: a study on sample size and shrinkage. Stat Med2004;23:2567-86. Alves A, Panis Y, Mathieu P, Mantion G, Kwiatkowski F, Slim K. Postoperative mortality and morbidity in French patients undergoing colorectal surgery: results of a prospective multicenter study. Arch Surg2005;140:278-83. Alves A, Panis Y, Mantion G, Slim K, Kwiatkowski F, Vicaut E. The AFC score: validation of a 4-item predicting score of postoperative mortality after colorectal resection for cancer or diverticulitis: results of a prospective multicenter study in 1049 patients. Ann Surg2007;246:91-6. Confalonieri M, Garuti G, Cattaruzza MS, Osborn JF, Antonelli M, Conti G, et al. A chart of failure risk for noninvasive ventilation in patients with COPD exacerbation. Eur Respir J2005;25:348-55. Hay AD, Fahey T, Peters TJ, Wilson A. Predicting complications from acute cough in pre-school children in primary care: a prospective cohort study. Br J Gen Pract2004;54:9-14. Hay AD, Gorst C, Montgomery A, Peters TJ, Fahey T. Validation of a clinical rule to predict complications of acute cough in preschool children: a prospective study in primary care. Br J Gen Pract2007;57:530-7. Iezzoni LI. Statistically derived predictive models. Caveat emptor. J Gen Intern Med1999;14:388-9. Hubacek J, Galbraith PD, Gao M, Humphries K, Graham MM, Knudtson ML, et al. External validation of a percutaneous coronary intervention mortality prediction model in patients with acute coronary syndromes. Am Heart J2006;151:308-15. Wyatt JC, Altman DG. Commentary: Prognostic models: clinically useful or quickly forgotten? BMJ1995;311:1539-41.